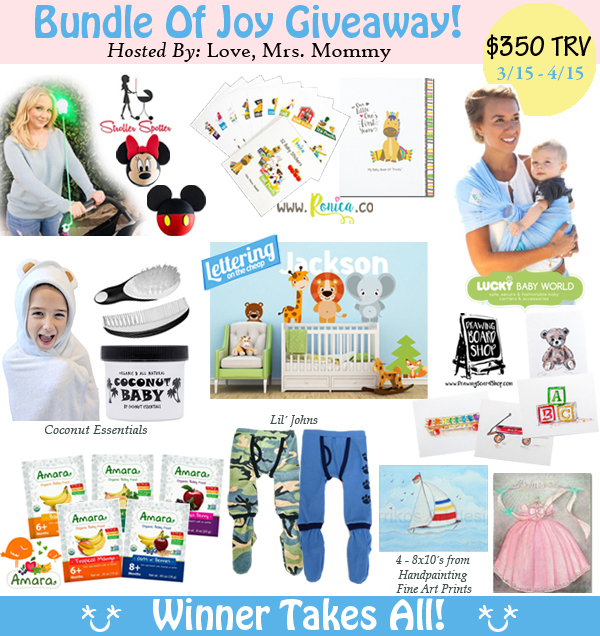 Love, Mrs. Mommy: Bundle of Joy Giveaway! $350 in Prizes! Love, Mrs. Mommy is thrilled to have put together this amazing Bundle Of Joy Giveaway! 1 lucky person is going to win ALL of these baby goodies - worth $350! As an amazing bonus... 5 out of the 9 products are Winner's Choice! Winner can pick color, style, or choice of item! Best of luck to all that enter! Receive this 9 card set of childhood firsts + 1 additional teddy bear note card from the Drawing Board Shop! All hand-painted cards! $21 RV! I'm due with my son in July and would love to win. Thanks for the opportunity!